Jonathan Morris is a prolific writer of Doctor Who fiction. He has contributed to many ranges, in every medium except television. His style has often been compared to that of Douglas Adams, perhaps in part because he dedicated The Tomorrow Windows to Adams. 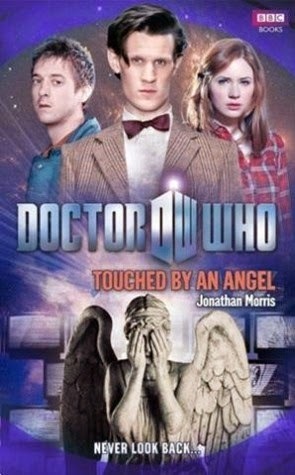 Indeed, this dedication was discussed at length in at least one prominent interview about the book, in which the interviewer's questions and Morris' answers left readers with the impression that the book was in fact "set in the Douglas Adams universe"
Doctor Who: Touched by an Angel is an entry in the new monster collection of books from BBC books. It was written by Jonathan Morris who is experienced at writing Doctor Who Spin-off material. 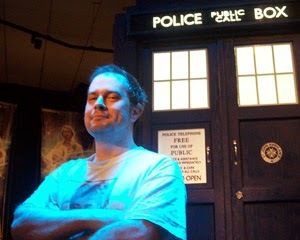 I have been a fan of Doctor Who for a while now and as such, was worried about reviewing any sort of spin-off material. The Doctors all possess a very unique style and voice that would be difficult to copy. It would be so easy to make any attempt laughably horrible. One quip in the wrong place, or one too many, “allons-y!s” and the whole thing would be ruined. The miracle of Touched by an Angel is that it actually worked! Jonathan Morris spins a tale about the 11th doctor, complete with Rory and Amy. During their travels they meet a man named mark, grieving from the death of his wife in a car accident. He receives a letter from 8 years prior saying, “You can save her!” He is given this chance by the touch of a weeping angel sending him back in time to his college days to re-engineer his life, and save his future wife. The Doctor, Rory and Amy have to save the world from the resulting paradox, save mark from him-self and save themselves from the Angels. The story follows Mark as he observes his younger self through all the stages of his life, intervening when he can to change his future. The Doctor and his companions intervene whenever there is a risk of paradox and help Mark to cleverly avoid paradoxes while still being able to change his history. I was impressed at how well Morris was able to take such a convoluted sounding plot and make it simple and entertaining. The angels were creepy as ever and received plenty of page time. The action wouldn’t lull for long before picking back up. In my opinion, the most impressive aspect of the book was how well Jonathan Morris captured the voice and energy of all the characters, including the Doctor. His quips and quirks were right on and quite funny. I couldn’t shake the feeling that I was reading the plot for a full-length feature-film, replete with Matt Smith and his charm. I would recommend this book to any fan of the Doctor Who series. Fans who are waiting intently for the new season and need their “Who” fix would be especially remiss to pass it up. Even if you aren’t acquainted with the lore, this would still be a very enjoyable read for any fan of quirky science fiction. I intend to read the rest of the books in the monster collection to keep me from getting too forlorn at having to wait until the new season airs.